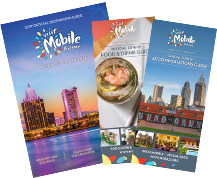 Mobile is a social town and nothing is quite evident of that than the many squares and parks scattered throughout the city, lined with benches, water features, statues and amazing landscaping. Bienville Square, anchored by an elaborate wrought-iron fountain, has long been the site of social and civic gatherings and to this day, hosts weekday lunches-in-the park, holiday festivities, culinary cook-offs and charitable fundraisers. Even the squirrels in Bienville Square are famous, so tame that they'll gladly take a peanut or two off your hands. Just a couple of blocks away is Cathedral Square, the ‘front yard' of the Cathedral Basilica of The Immaculate Conception. Another popular public gathering space, Cathedral Square has served as a backdrop for generations of family, senior and prom pictures and in the spring and fall, the square hosts a farmers market, art festivals, music concerts, fashion shows and more. As you wander out and about through our historic districts, you&apos;ll be delighted to find other squares, like Washington Square in the Oakleigh Garden District or British Park in the Church Street Historic District, that serve as the social and cultural hub for these neighborhoods, as well. To the west, the 720 acre Langan Park encompasses the Mobile Museum of Art and includes biking/jogging paths, a large lake and a beautiful setting for becoming one with the outdoors. It also features the country&apos;s largest Tennis Center, children&apos;s playgrounds and picnic areas and is also home to the Azalea City Golf Course, the Mobile Botanical Gardens and Playhouse in the Park. Not quite as big as New York&apos;s Central Park, but close! You could spend a day or three exploring. And of course, you wouldn&apos;t want to miss Mobile&apos;s Bellingrath Gardens and Home with 65 acres of year-round floral pageantry in a Southern estate garden, located in west Mobile.